A forest fire can wreak an incredible amount of devastation in a very short space of time and wildfires have been responsible for killing many people over the years. One of the most common mistakes people who are trying to escape a wildland fire is to try to outrun it. However, even in less dense forests, wildland fires travel so quickly and faster than you can run. By having a good knowledge of the way in which a forest fire travels and by having some awareness of the terrain you are in, these two things combined give you the best opportunity of surviving a forest fire. One of the first things to remember is that a forest fire travels uphill far quicker than it travels downhill. Therefore, if you see an opportunity, you might be able to keep in advance of the fire by moving downhill as quickly as you can. Knowing your terrain and your current position in relation to it can help too. Think of any roads, or stretches of water such as a lake, river, stream or pond that may be close by and head towards them where it’s practical to do so. Anywhere there is little or no vegetation which is able to burn such as the examples above can buy you valuable time.Knowing your trees can also help. 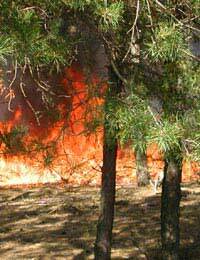 Evergreen trees, such as conifers and those which have needles burn far more quickly than deciduous trees. Therefore, if you’re presented with the option between the two to try to escape, choose an escape route through a deciduous thicket of trees. What If The Fire Is Up Close? If you’re completely trapped and the forest fire is in such close proximity that an immediate escape is not possible, you should try to find or even dig a ditch into which you should climb and keep yourself as low down as possible. Curl yourself up into a ball and, where possible, cover yourself up with a blanket or a coat if you have access to these items. If you’re able to, soak the blanket or coat in water first. By making sure you’re low down and covered up, this will give you the best chance of minimising the effects of the suffocating heat and smoke as so many people die in forest fires each year due to excessive inhalation of the smoke as opposed to being burned alive. If you’re lucky enough to survive the fire, then once it has passed through, move upwind where the fire will have already burned out the vegetation. If you’re in a remote woodland area where a forest fire is about to take hold, the likelihood is that if you’re not aware, it will be upon you in no time at all. Buying yourself extra time can mean the difference between life and death. Therefore, it’s a good idea to be aware of the signs of fire approaching. Obviously, this is likely to begin by you having a vague sense of smelling smoke. If that occurs, look at any cars, awnings and tents that may be in the area. A sure sign that fire is approaching is where you can spot fine particles of ash which will settle on these kinds of surfaces. Look up into the sky and see if you can spot any hazy areas which don’t seem in keeping with the rest of the sky. Obviously, if the ash thickens and the smell of smoke becomes more pungent, then the approach of fire is imminent. Many forest fires often begin due to someone’s carelessness or negligence - a discarded cigarette end being the most obvious. Therefore, it’s important to be aware of the safety procedures with regards to fire when out in the woods and to follow any rules, regulations and signs which are in place. Pay particular attention to safe cooking procedures at camp as well as ensuring that any campfires you build are permitted, are within the regulations and that they are closely monitored at all times and extinguished properly. Also, pay attention to any instructions you may receive from firefighters that might be trying to stem the blaze. If a fire is burning out of control around you, it’s easy to panic and to do the wrong thing. However, where firefighters are present, they will have been professionally trained to deal with all manners of firefighting and all members of the firefighting team will be working in co-ordination to ensure that the fire is extinguished as quickly as possible and to get people to safety. Therefore, if they tell you to do something, don’t question their judgement – just do it. It could save your life.